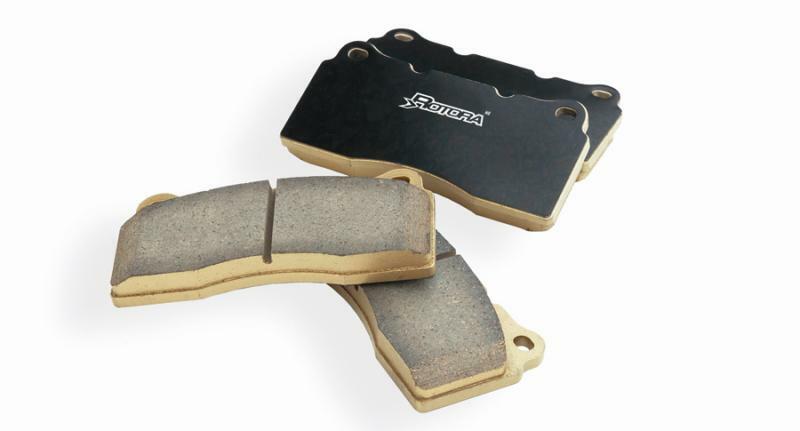 Rotora Ceramic-Carbon disc brake pads are the latest high performance street and race pads to be introduced into the aftermarket. Rotora has applied the same materials, engineering, and quality standards from the formulation used in its high performance brake systems to OEM vehicles with stock calipers. Designed for extreme street or track and hard braking applications, Rotora pads feature ceramic-carbon strengthened non-asbestos formula with a high co-efficient of friction and high temperature fade resistance with quick recovery to offer more consistent pedal feel for driver confidence. Rotora is constantly developing and refining new ceramic-carbon brake pad compounds and new variations will offer nothing but the very best in all aspects of brake controllability and reliability. H2 high-ceramic pad offers a solid brake fade resistance to increase driver’s controllability. Whether weekend light track, drifting, or daily driving, Rotora’s ceramic formulated H2 pads accommodate all driving styles, track lengths and environmental conditions. The ideal pad for all-around performance, daily street, and track ready. Top of Rotora’s ceramic pad range is the H8 ceramic-metallic, the road race-spec upgrade offering tremendous fade resistance and thermal stability under high brake disc temperatures. Recommended for serious racing, H8 ceramic-metallic pads produce high coefficient of friction thereby providing ultimate stopping power and excellent pedal feel response from the very start. With strong initial bite and consistent Mu level, this is the ideal pad for road racing/endurance/high circuit.